Displaying 21 - 24 of 48 sketches (page 6 of 12). The original paper pages for these sketches are available online as a PDF file. What about the possibility of life on these worlds [i.e., the solar system's terrestrial planets]?... Although we must be careful not to be too positive, I think most scientists agree that this recent work [by G.A. Tikhov and W.M. Sinton in the 1950s] points strongly to the existence on Mars of some drought-resistant type of vegetation, which revives rapidly from a dormant state when the polar frosts distribute moisture over the Martian surface... this, together with the other phenomena of the Martian surface, is the only well authenticated and positive evidence we have for the existence of organic life elsewhere than on Earth. From Peter M. Millman, This Universe of Space (Toronto: Canadian Broadcasting Corporation, 1961), pp. 26, 28. Peter Millman was a first-rate scientist, and the most experienced of the Montreal observers were reliable recorders of what they saw. Yet we now know that the ca. 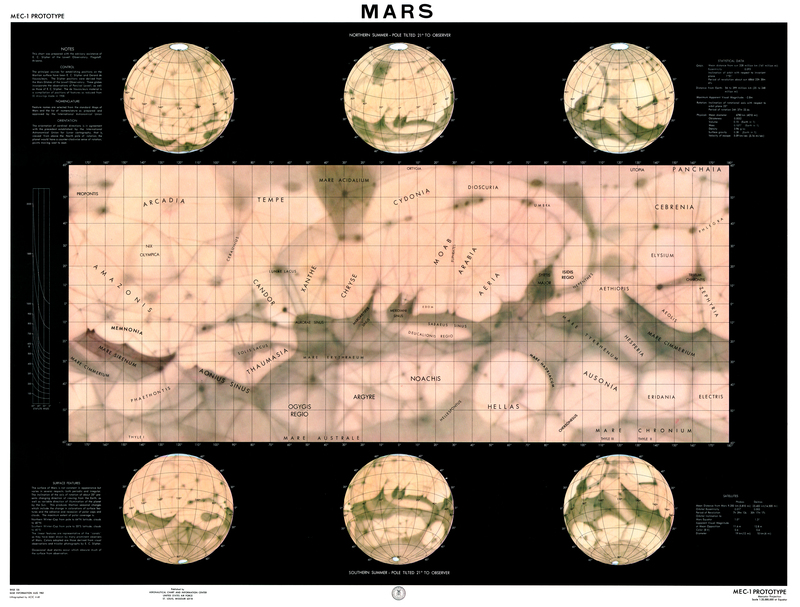 1877-1960s paradigm of Martian canals and Earth-like vegetation is wrong. The moral here worth pondering is that no matter how knowledgable, skilled, and experineced you are, you cannot entirely escape the influence of the scientific models of your time. Prevalent astrophysical theories about the chatacteristics of celestial objects will affect what you see at the eyepiece, even when it comes to details beyond instrumental resolution! It has ever been thus. Speaking of amateurs alone, the lesson appiles as much to visual observers as it does to astrophotographers (the philosophical impossibility of achieving the chimera of "absolute" objectivity is no reason to abandon self-criticism of one's own work). There is doubtless also a salutary warning here for how we choose to handle data from the most recent (and future) Mars missions, and how we choose to think about exoplanet data, models, and the possibility of life on other worlds. I've downloaded the PDF file, and gone through it. I was actually the person who put that file together back in 1961, and added the numbers in the corners! I honestly can't remember what the left-hand numbers signify, but it will probably come back to me. The right hand numbers are a sequential numbering of all the drawings of Mars submitted by everyone in the centre for that apparition. The drawings in the PDF are drawings which I selected as being of the highest quality by experienced observers, to form the basis of my map. You have to remember that this was in pre-computer days, so I had to organize things manually. My primary objective was to prepare a map based on our observations. This was partly for purposes of my report (which may have appeared in the Journal), and partly as a term project for a course in cartography which I was taking at McGill that spring. I originally had grand plans to project the drawings onto a sphere to obtain longitudes and latitudes, but gave up on that. What I did was to use an ALPO [Association of Lunar & Planetary Observers] map from the previous apparition as a base, and draw my map using positions on that map, but detail from our drawings. To do that, I needed to sort the drawings by central meridian, which is how they are arranged in the PDF. However, I thought I might need to put them back in chronological order at some point, so, before sorting them by CM, I numbered them in chronological order in the upper right corners. So your surmise about this being an index is correct. However, for purposes of study, the present arrangement by CM is the best. These are the drawings selected as the best; the rest are primarily by beginners made at an observing night at the observatory where everyone lined up and took their turn at the eyepiece of the 6-inch refractor. Most of these are pretty awful, and probably not worth preserving! [Any such sketches are included in the PDF file, but not in the online sketch gallery. ]—Geoff Gaherty, May 2013. Further Reading: RASC Planetary Section Bulletins from the 1960s. What did the Montreal Mars observers think of the possibility of the canals, and their relation to what they were seeing at the eyepiece? We were already very skeptical in those days, and were aware that what we were drawing might just be our perceptions "connecting the dots." I can't recall ever seeing anything linear myself; I more had the idea of blobs of various sizes.—Geoff Gaherty, May 2013. I think it fair to say that we were all still influenced somewhat by the "Lowellian paradigm" in those days and maps like those of Slipher [Earl C. Slipher 1883-1964] and indeed many others at the time all showed diffuse streaks like those in my drawing. We referred to them as "canals" because they were labeled as such on those pre-Mariner charts. We had long ago given up the idea that they were actual Lowellian irrigation canals, and considered them more like borders between area[s] of different color, brightness or contrast. In addition to Slipher's photographic work, we were very much aware of Antoniadi's observational work at the time [see this, and this] and considered his presentations of Martian features much more realistic. I was personally also very impressed by the observations and photographs of the then more recent French observers, including de Vaucouleurs, Lyot, Camichel and Gentili working at Pic du Midi in the 1940s and 1950s (See Larousse Encyclopedia of Astronomy (1959)), all of whom still showed streak-like "canal" features they attribute correctly to albedo differences.—Klaus Brasch, May 2013.